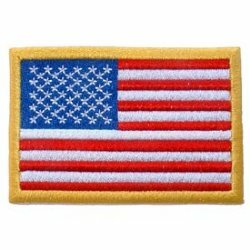 Left arm, red white and blue flag Patch with gold lining. Measures 2.5"x3.5". Features a hook style backing making it ideal for attaching to anything with a Velcro surface such as backpacks, jackets and hats.